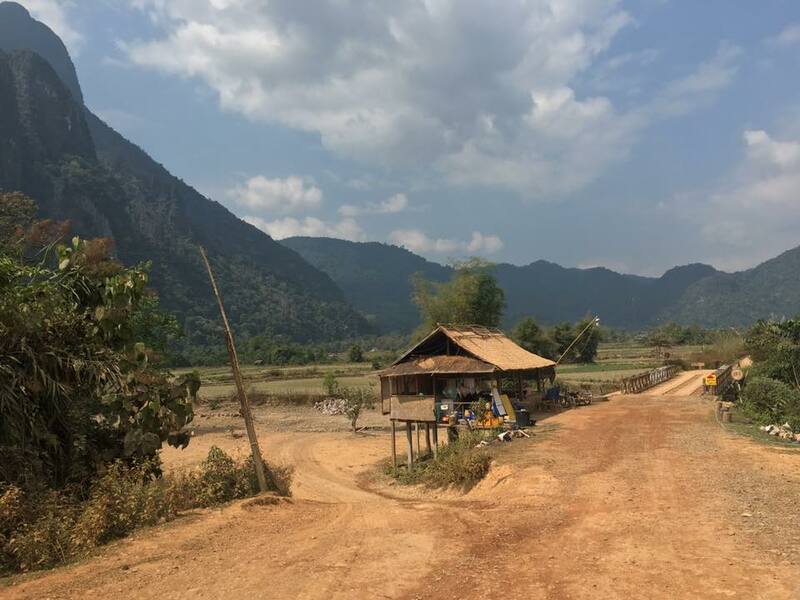 and we were happy to be staying in the tranquil village of Ban Huay Yae immediately across the river to the west (see below). There’s a toll (west-bound only) on the bridge, but you can avoid this by using the footbridge from the centre of town, just north. Incidentally the town itself did not really exist before the CIA built an airstrip for covert operations during the Vietnam War; this is now unused but still exists as a bizarre gaping hole in the centre of the town. Rafting is very popular, and you can rent bikes, scooters, off-road buggies (very popular with Koreans, it seems), and even some three-wheeled Segwayish things (why? ); you can also go rock-climbing and hot-air ballooning. However, our chosen outdoor activity was cycling a 28 km loop to the west, through dramatic karst scenery with plenty of caves to visit. Beware! Health and Safety is still not a big deal here, so be prepared to climb on rough rocks and flimsy wooden ladders, and it’s best to bring your own head-torch if possible – there’s someone to rent you one at most caves (for 10,000 kip – about £1) but you can’t rely on it. En route we stopped at a small cafe in a wonderful location and had a very connecting chat with the husband and wife as we were the only guests. They managed to rustle up Twinings tea and fresh milk to revive us for the rest of the journey, which was rather bumpy at times and tiring in the heat but well worth it for seeing how life is lived in this rural area. English. We ate our breakfast there and discussed our plans with Philippe before heading off for the day. Nearby is a laundry service and motorbike and bike rental. excellent murals (painted for King Anouvong in 1819-24) on the life of the future Buddha now being restored. 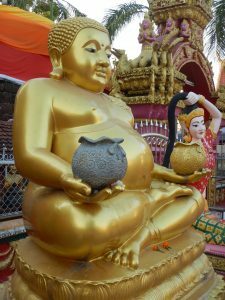 Wat Ho Phra Ko (daily 8am-5pm, 10,000 kip) seems grander but the sanctuary actually has a bare barn-like interior with old pot shards and Buddhas in museum cases. Wat Si Muang (daily 6am-7pm, free) is hilariously gaudy, not to say kitsch, but the remains of an ancient Khmer stupa can be seen at the rear of the sanctuary. 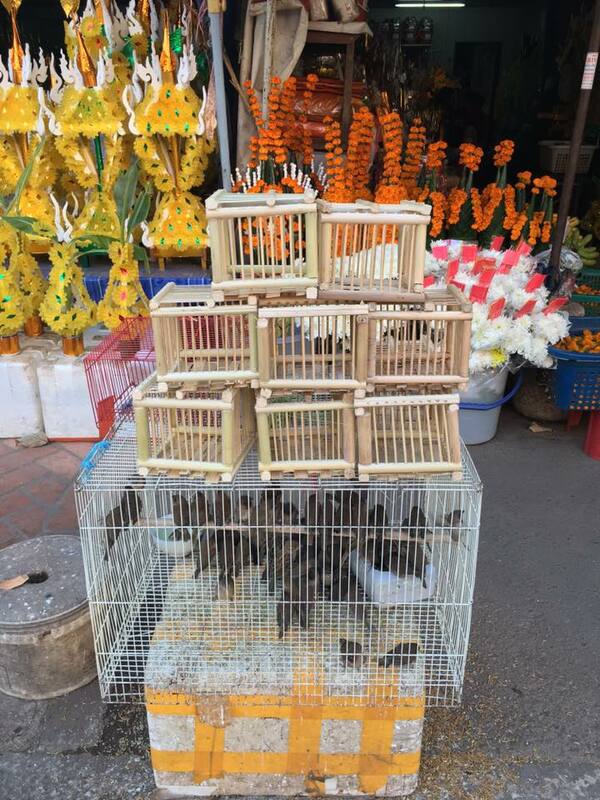 A horrid custom which is still prevalent in Laos is the selling of small birds outside the temples. The idea is that people earn ‘merit’ from the gods when they release them into the wild. (Presumably only to be threatened with being recaught in due course.) 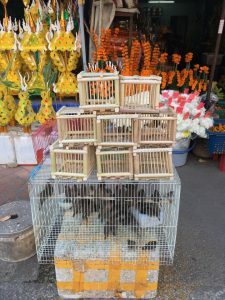 We saw the distressing sight of dozens all squashed together in cages in the searing heat outside many temples. 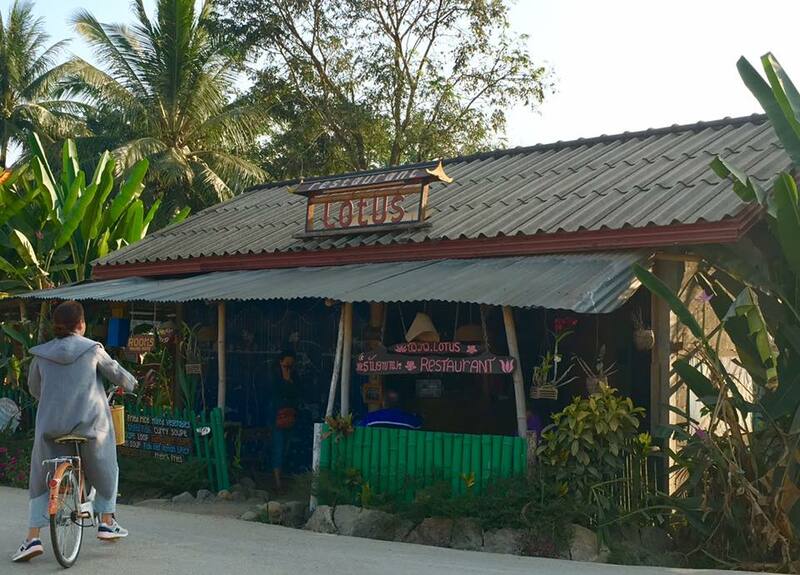 Various NGOs in Laos and Cambodia, helping landmine victims and street children, for instance, have opened restaurants both to raise money and to train people to work in restaurants. This website gives details. 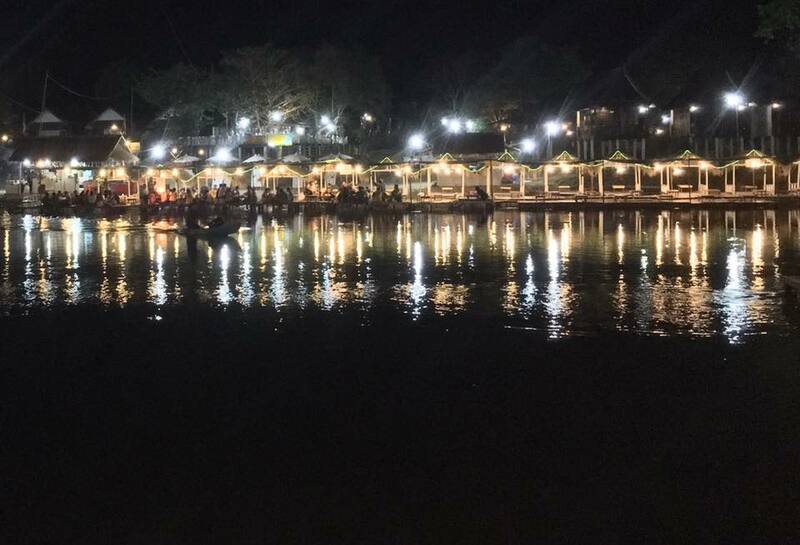 Opened in 2006, Makphet (meaning chili in Lao) is firmly established as one of the best places in Vientiane for creative but authentically Lao cuisine. The setting, indoors and outside in the lovely gardens, is beautiful, and there’s also a small gift shop, selling craft items made by families to help keep their children in education. However in March 2017 it was announced that Makphet had to close temporarily due to the expiry of its lease. We didn’t know about this when we were in Luang Prabang, but the same NGO has recently opened a restaurant there called Khaiphaen (named after a popular snack of crispy Mekong river-weed), at 100 Sisavang Vatana Road, Ban Wat Nong, between the French Institute and the Mekong; it’s open Monday to Saturday 11am-10:30pm.